Hi Friends, Apple iPhone X Design is just similar to the Vivo V9 Smartphone. Before the launch of Vivo V9, Peoples had different ideas about Price, Camera, Design and Display, But now Vivo V9 Full HD Plus display smartphone come into the market aand today we will know about Vivo V9 Killer Phone Specification and Review and is it best from others phones? Everytime Vivo’s smartphones comes in trending from its Camera but in this time Vivo V9 comes in trending from its design, Display and Camera. I will tell you, everytime Vivo and Oppo copied Apple iPhone’s Design, Specification Copy and in this time they copied iPhone X Complete Design. But in this article, we are not talking about Vivo’s disadvantages. We will talk about Vivo V9 Specifcation and Price in detail and also talk about Vivo V9 Killer phone review and is it good or bad about value For Money Product. When we give our review we just talk about its Specifications and its Price. 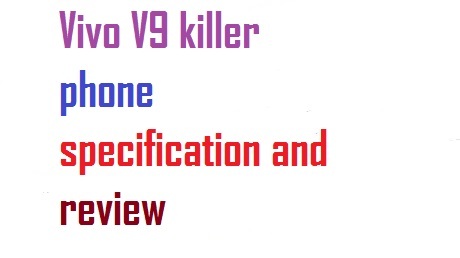 Because it is not possible that every man’s thinking is same, So here we will talk about Vivo V9 killer phone’s Specification in detail and after that we will Compare this phone with other best smartphone. Vivo V9 has one of the best Feature is its Display and as a result of this Vivo V9 is going trending. Vivo V9 can has 6.3 Inch Full HD+ Display with Gorilla 3.0 Protection. The Screen of this Smartphone has Full Screen Display which is similar to the iPhone X. It has 1080*2280 px Screen resolution which has best quality of video and give us 2.5D touch feature. Ultra HD, PPT, professionals, Slow, Time-lapse photography, Camera filter, Live, AI Bokeh, AI HDR, AI Focus beauty, panorama, 4K Video, Plam Capture, AR Stickers etc. In this Vivo does not think about its Design, Camera only but also give a big Processor . Here Vivo V9 has Snapdragon 626 Processor and Android Oreo OS. This Processor is not so good but this processor is so good as compare to the Redmi Note 4. Vivo V9 can has 4GB RAM and 64GB Internal Storage and has SD Card Support which we increase upto 256GB. Vivo V9 supports 3260mAh Non-Removable battery and if we talk about its price, the Price of this Vivo V9 in market is Rs. 22, 990 and it is easily Available. These all of Vivo V9’s primary Specifications. It also has High responsive Fingerprint Lock/Unlock System and also has Phone Sensor. Vivo V9 Phone also supports OTG, USB and all other important features. The Specification and Price of Vivo V9 are good and Vivo V9 is the Best but the Price is not so good. Vivo V9 has Full HD Plus Display , which is best for both Video and Gamming. It also has a Full-Screen Display , which consist 2.5D touch and Gorilla Glass protection. and if we talk about its Price, when we talk about the value of Screen, the price is not much higher. We do not talk about its Camera because its camera is perfect and also has Front and rear Camera both gives a Best Quality Photo Capture. And its back Camera beats the Redmi Note 5 back Camera. That is why, its camera is perfect. If we talk about Vivo V9 Killer Phone Review, it is not 100% perfect Smartphone because of its Price but it also supports others good features .Share this article on your social networks. Thanks for reading this.